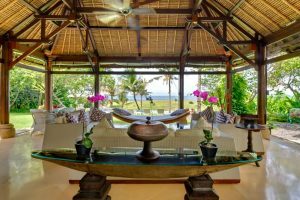 The huge poen sided living pavilion provides ocean views set on cream terrazzo floors under a soaring two-tiered roof. 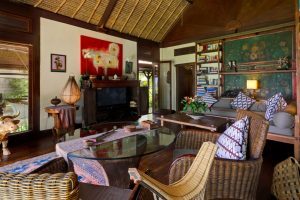 Huge sofas-provide comfortable space for lounging, a saurwood table seats 14, while a smaller breakfast table provides a more intimate space for four and the coconut-shell bar is the perfect setting for sundowners. 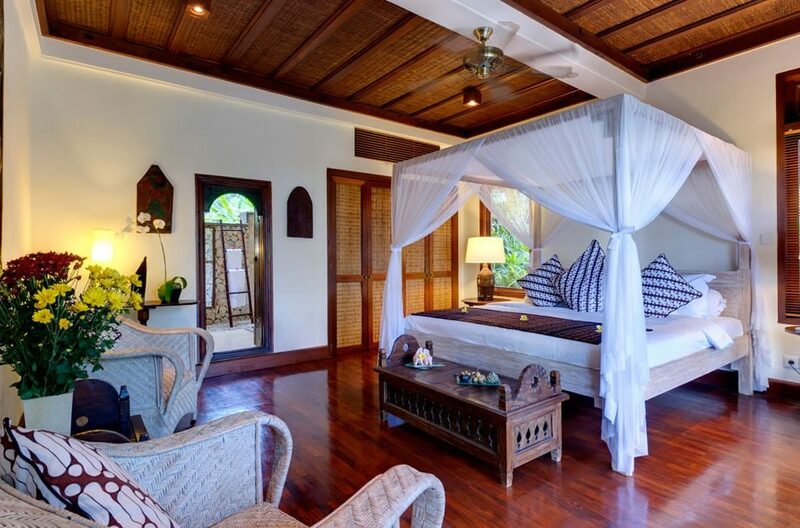 In the master bedroom pavilion is the TV lounge with an array of fascinating artefacts. 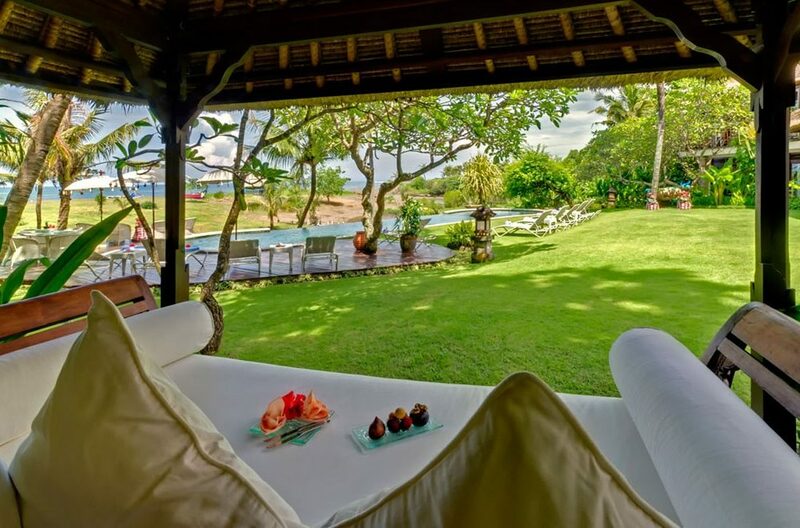 Outdoors a nature paradise awaits with fragrant frangipanis and tropical coconut palms all mix in harmony. 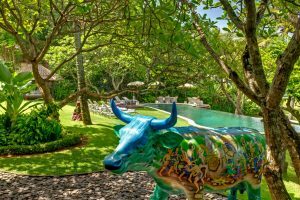 The natural green-stone pool – free-form in design – is perfect for refreshing dips, sun seekers will enjoy lounging on the poolside deck and the garden bale. Four king size bedrooms will comfortably accomodate 8 guests. 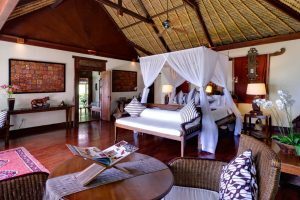 The master bedroom with four poster king size bed provides ocean views, sitting area, garden bathroom, with open-air shower, twin washbasins and a circular terrazzo bathtub for two. 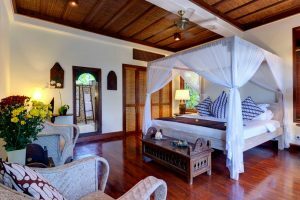 Three guest rooms feature king-size beds with terrace and two downstairs rooms open onto the garden. 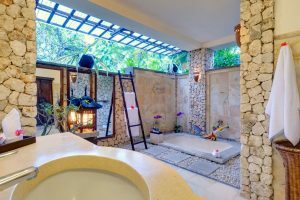 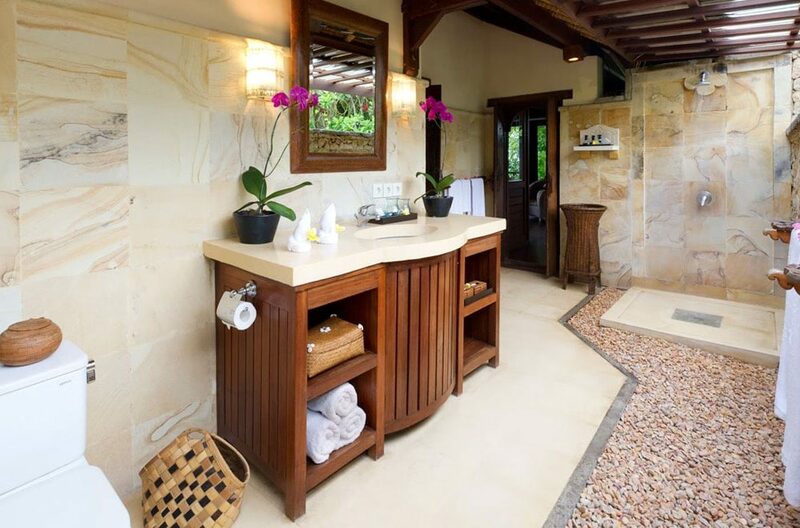 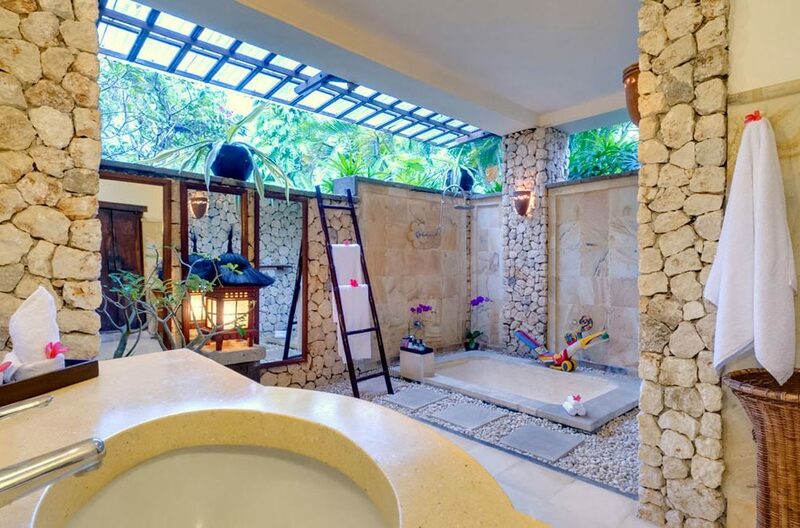 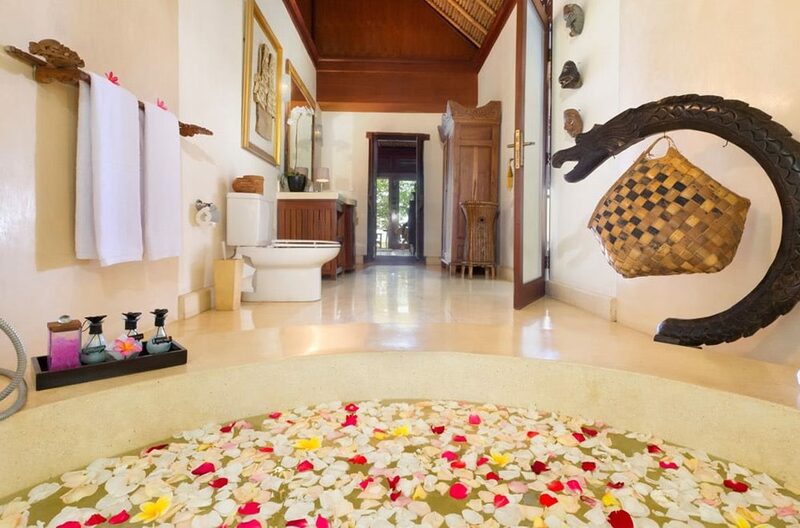 All three ensuite bathrooms are individually designed – one with a sunken terrazzo tub, one with an alfresco shower, and the upstairs bathroom with a shower looking out over rice-fields. 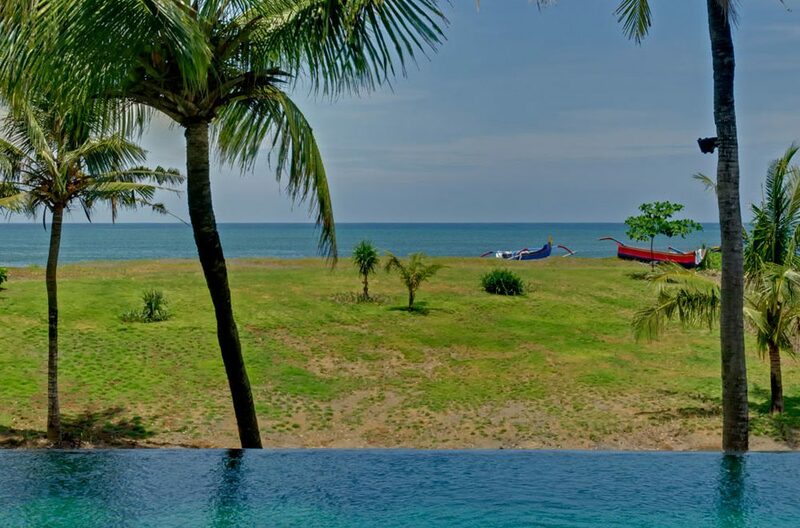 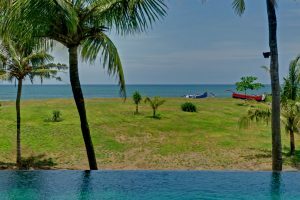 Villa Sungai Tinggi is just 1km from Echo Beach, a great surf spot and famous for sunset seafood BBQ’s. 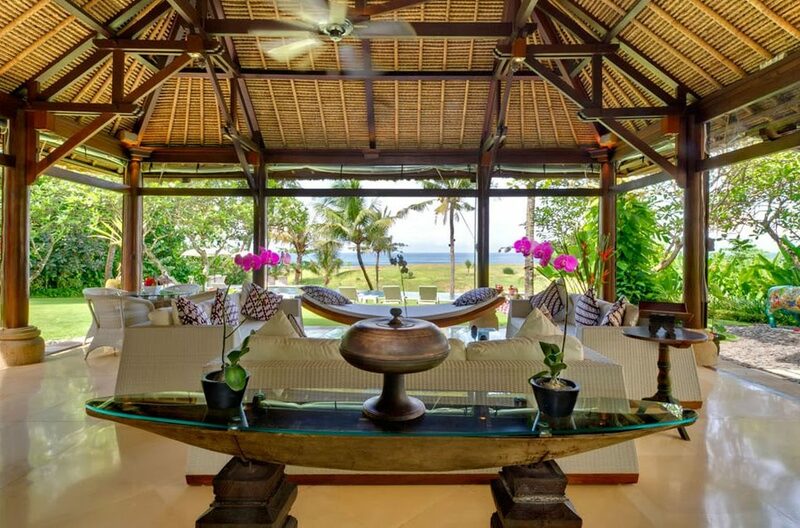 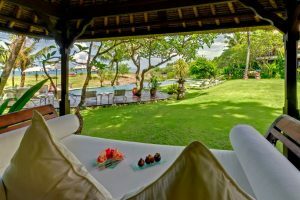 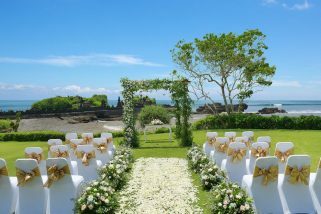 The world class Greg Norman, Bali Nirwana Golf Course is a short drive away. 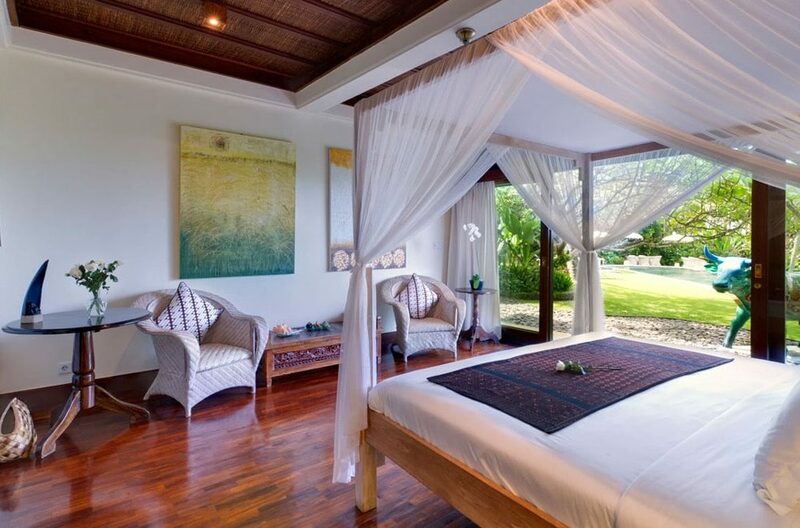 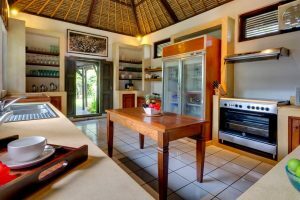 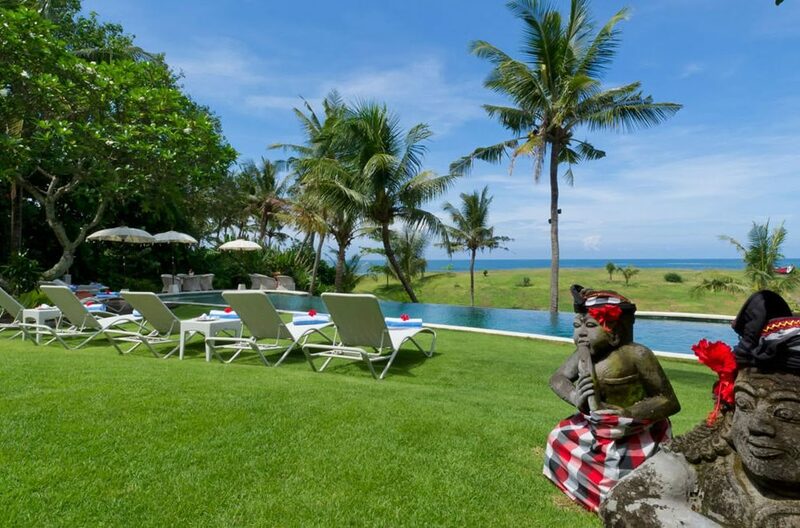 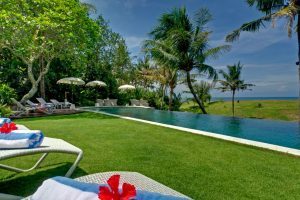 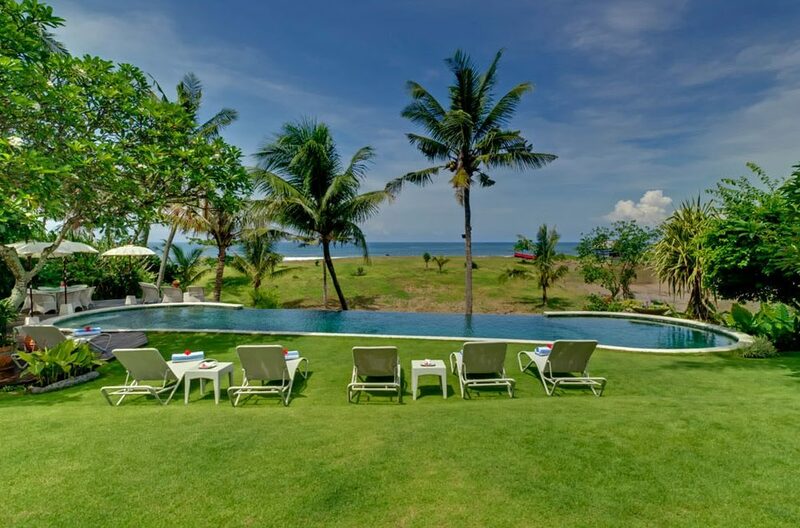 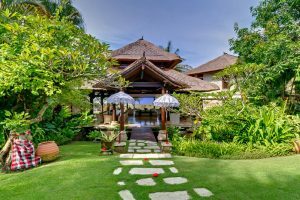 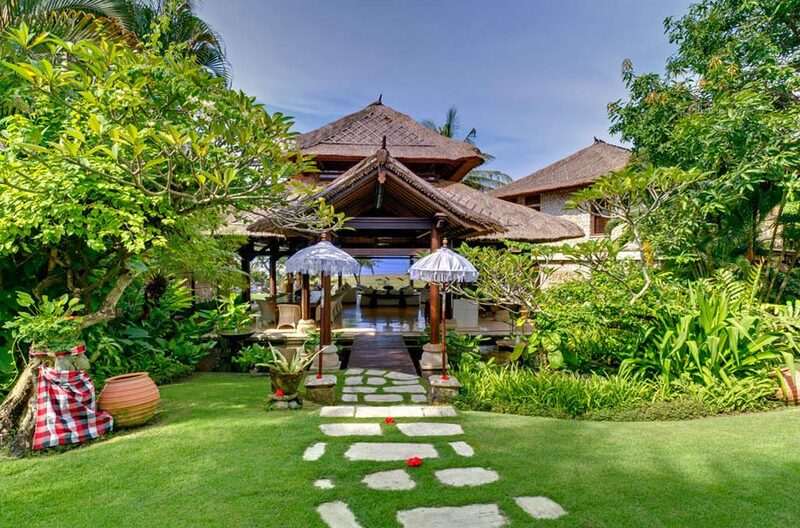 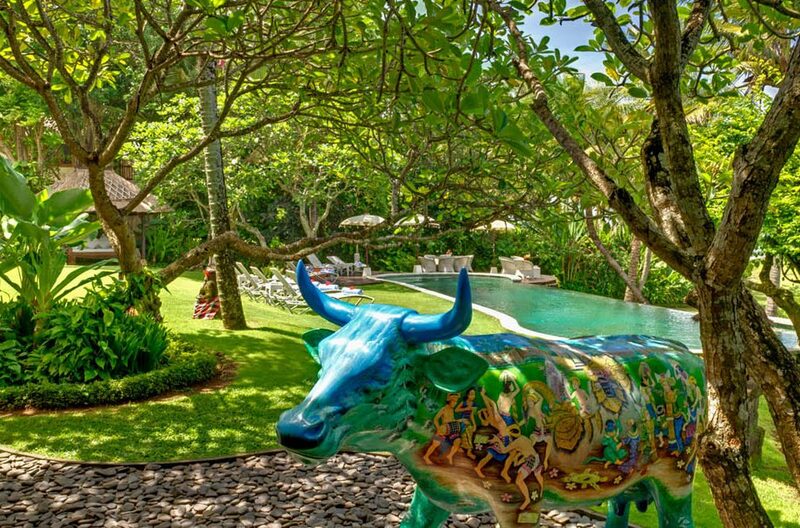 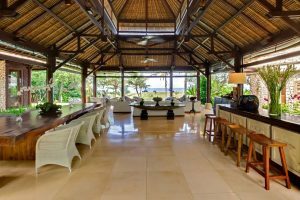 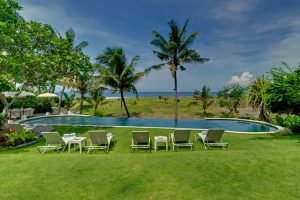 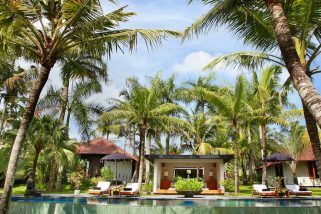 Villa Impiana is a 6 bedroom Canggu villa holiday rental & is a majestic beachfront estate located at Cemagi Beach on the outer fringes of popular and very trendy Canggu.